This is the dovetail set I made for the most recent tool swap. The woods are walnut and quilted/birdseye maple. Everything was made from stuff I already had laying around the shop. 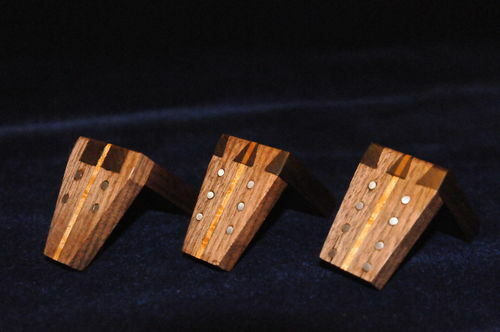 The dovetail markers are 1:4, 1:6, and 1:8 marked by the brass pins. The marking gauge was made to extend a max of 2 in. The cutter is an old jig saw blade. The marking knife was the hardest for me as I do not have a lathe. I ended up fling down a steel threaded rod and then hardening the cutting edges. The block plane is unfinished in the pictures because the bed shifted during glue up, but I did not want this to delay sending. So I am in the process of making another to send. Lastly, I felt all the products needed a home and something that could sit on the bench next to you while you are dovetailing would be a nice touch. So I scrounged up a bunch of scraps, touched them up and attached them to a piece of scrap walnut from the burn pile (too much sap wood for any projects I could think of). The piece of maple on the far left is a place to rest a DT saw when working. All finished off with equal parts BLO, beeswax and turpentine. The set turned out great. Well done. WOW!! I’ve always used a bevel gauge to mark my DTs. These are the first DT markers I’ve seen that could change my mind. In fact, with your permission, I’d like to copy them. A beautiful addition to any show. Beautifully done. Wow those are great and quite a set. Why is this not a top 3? Haha, Jordan. As long as you are happy with your new toy, then I wouldn’t mind if it never showed up on the main page… I hope to see a picture of these in use in the near future!